Islam is the religion of peace.Any thing that proves otherwise is not part of it. Too often we value those things we do not have. We focus more on the amazing things going on in other people’s lives but not in ours. Yet in no matter situation we may find ourselves, chances are we have got treasures we have either chosen to ignore or haven’t yet discovered. This is so important for our mental, spiritual and by extension, physical well being. Replace that sulk with a smile. Look inwards and be amazed at what you find. To make it even resonate better, get out your stationery and make a list of all the good things you have. For this earth and all the beautiful creation, being alive in itself, freedom,health, good hair, good skin, spouse, children, a bed to sleep on, clothes, food…..some of these are gifts millions do not have and yet we find them leading happy lives. In all, no one has everything. We are meant to partner in goodness and make each other better. We should not flaunt our possessions to sadden others. Neither should we gawk at the blessings of others forgetting ours. Do not place too much happiness on material things. With the sheer volume of edited images on the net we are bombarded with today, this may seem impossible. But you see, we should take charge of more things in our lives and thus make conscious efforts to do self-reflection. That rich person on earth may have none of the Akhirah and the outwardly poor one already has a great abode. Let us be more concerned with our standing before Allah ( SWT). We should strive to enjoy the most of every moment and opportunity. Yes we may not have what we want yet but we keep on working towards our goals and not being knocked down by challenges. Who are we if not the #PeopleofAlhamdulillah? 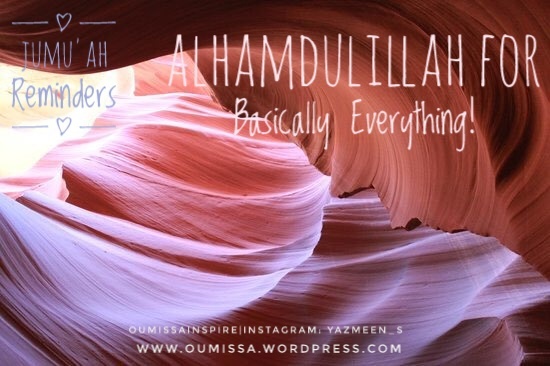 Have a most amazing Jumu’ah. There are many checklists circulating. Make sure to make the most out of it. We can not thank Allah enough for HIs Mercy. May He accept all our deeds and assist us as we try to infuse all we did in the last month into our daily lives. If you have not paid Zakatul Fitr and you are able. Kindly do so before the prayer. Take a bath and wear perfume (men!) We don’t want to make others uncomfortable. Wear your best clothes but please remain modest. If you have enough food to cook, open your doors and enjoy your feats with others. Exchange gifts! It increases love for each other. Take different routes when going and coming from the Eid prayers. Listen carefully to the sermon,no Nawafil (voluntary prayer) before the Eid as it is a Nawafil(albeit highly recommended). Give the children treats! This builds fond memories for them. If you live in a country where there aren’t many Muslims, do your best and join others online. Keep all those we lost in Ramadhan in your dua. Help their families if you can. Remember the Shayateen are out. Keep feeding your soul. EID MUBARAK to all of you around the world. Taqabalallahu minna wa minkum(may Allah accept it from us and from you). The blessed month bids us farewell. We can only hope to see it again. Or hovering around previous levels? All through this month, we try to offer more Nawafil (voluntary prayers) at night. We do this with the firm belief and hope to draw closer to the Entity central to our being- Allah (subhanahu wa ta’ala). Even if we only get to squeeze two units of this prayer before Sahur , we are very happy.. If we wake up late and can hardly get a bite before the Adhan is called, we feel dejected throughout the day. It is a great thing to get up and seek Allah’s Bounty while others sleep or commit nefarious acts. Now imagine you could get it every night. Would you sleep at all for the entire night? Indeed what regular Tahajjud gives you is better. Take it upon yourself to say Tahajjud More, even if it is two Rakat for those little bit constant deeds are beloved to your Lord. Civilizations throughout history have flourished on knowledge. Today, countries regarded as developed in which there are better prospects for citizens are those who place high value on knowledge and thus enjoy advancement. The first revealed verses were a command to read, with references to teaching, writing and the pen (Q96:1-5). This and many other verses talk about books, and Him being the source of all knowledge thus showing the great importance of knowledge. The Prophet always had scribes to record revelations, his narrations, political affairs and various treaties and agreements. The companions and those who came after them spent their lives constantly gaining knowledge, with much sacrifice and going through great lengths of time and distance to do so. Gender and age were no barriers. It is how we have the Qur’an in written form, collections of Hadith and treatises on many other areas like medicine, genealogy, politics, algebra, astronomy, commerce, and other sciences and arts. Much of this is still relevant today. Try doing some research on the first university in the world, Al- Jabr, Al- Khawarzmi, the libraries of Baghdad and Damascus centuries ago. It is saddening how we have trivialized and even destroyed our own heritage. It is not something to be slack about. We should not live our lives content with what we learnt as children or worse, the knowledge of our ancestors. We also need to stop giving excuses as the early Muslims had greater challenges. It is a lifelong duty. We must always seek answers to our problems and learn more about our religion. Through that can we truly make our existence on earth a worthwhile one and be of benefit to others whether they share our beliefs or not. For it is a lack of correct knowledge that would make a person destroy innocent lives ostensibly to defend Allah, His Prophet and the religion. What they achieve instead is harming everyone regardless of creed. Learn the aspects of Iman, how to perform Salah as the Prophet(peace be upon him) said, “Pray as you have seen me pray.” Learn the conditions of fasting, Zakat and Hajj. Learn about family life in Islam, treatment of relatives, neighbours, men , women and children. Learn the Qur’an, Hadith, stories of the Prophets. For we would find nought in this except goodness. Learn whatever skills you have a flair for, are good at or are interested in and seek to be the best at it. Support and carry out research. Use this knowledge to benefit humanity. Just think where we would be in the absence of vaccines, aeroplanes, cars , trains, satellites, the Internet and countless other aspects of the modern world we take for granted. If we do not know, we can not teach. The best thing we leave after we die is our body of knowledge.